The Extreme Sailing Series – Cardiff is on its way. This leviathan rolls into Cardiff Bay next week with the sails unfurled and set ready to go on Thursday 18th June. The Bay has no respite until Sunday 21st June when the sun will set on Act 4 and the boats are packed away on the longest of days to move onto Hamburg. The best place to view this Midsummer madness is from the Waterfront and Barrage. Running alongside the Extreme Sailing Series in the shoreside will be food and drink stalls, live music, ‘have a go’ activities for all the family. 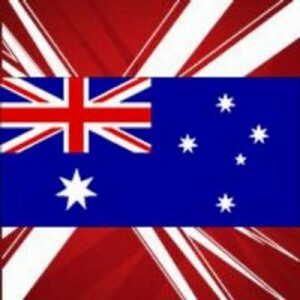 The final act of the Extreme Sailing Series will be held in Sydney, Australia. 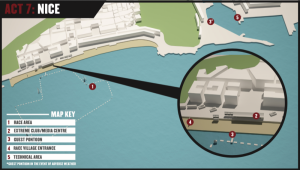 The final venue, Extreme Sailing Series Sydney, is unique in that double points are up for grabs so theoretically 5 teams are capable of winning a position on the podium. The race takes place from 11th to 14th December 2014. The venue is, or course, Sydney Harbour. Farm Cove to be exact which is between Garden Island and the iconic Sydney Opera House. An exclusion zone will be in force to keep the area clear for the racing. 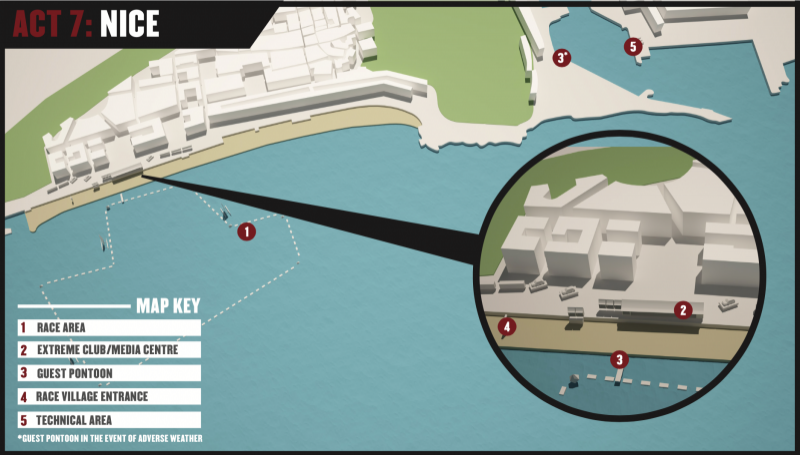 The Race Village can be found at Mrs Macquarie’s Point. This can be reached by walking through the Royal Botanic Garden and through the Queen Elizabeth II gates on the eastern side of the Opera House Forecourt. For those of you staying on the other side of the Harbour, Kurraba Point, Cremorne Point and Athol Bay on the North Shore will also provide fantastic viewpoints. The Extreme Sailing Series Sydney promises to be as spectacular as the scenery and together with that infamous Aussie hospitality, a fitting end to the tour. The Extreme Sailing Series will be winding it’s way over the hills and valleys to Cardiff for Act 5 starting from Friday 22nd August until Monday 25th August 2014. Sailing will take place in beautiful Cardiff Bay over the Bank Holiday weekend and forms part of the Cardiff Harbour Festival. Members of the public can enter the Race Village on Harbour Drive and you can see the Extreme 40 catamarans moored close enough to nearly touch! Racing for the Extreme Sailing Series Cardiff will take part in the bay and viewing will be possible from Harbour Drive. For more information visit the Extreme Sailing Series webiste. 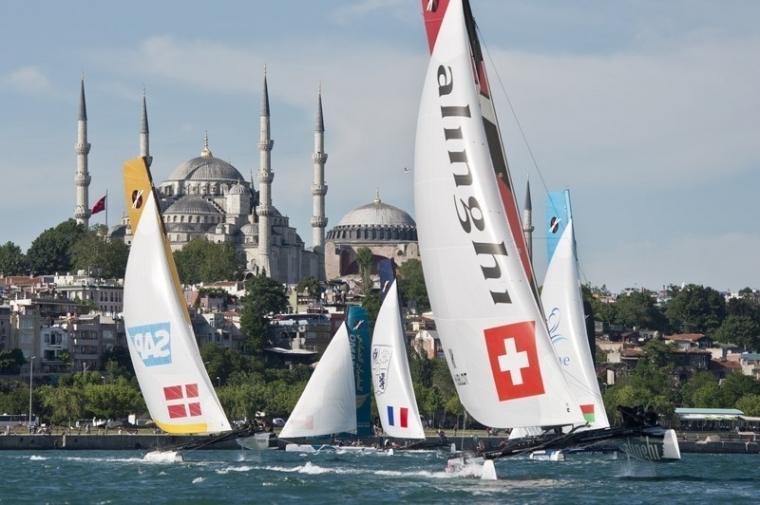 What is the Extreme Sailing Series? I’m fairly new to sailing as you will know, and keep seeing tweets and references to the Extreme Sailing Series at the moment. I’m not sure what this is so thought what better way to learn than to write a blog about it. So, the Extreme Sailing Series is a series of sailing races. 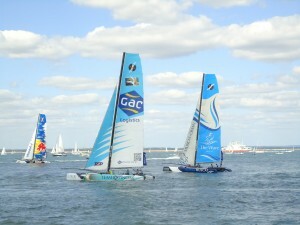 Currently the teams use a class of catamaran called Extreme 40. As the number would suggest, the catamarans are 40 feet long and, coincidentally, can attain speeds of 40 knots. Other impressive statistics include a mast length of 62 feet, a 23 foot beam, a mainsail measuring 75 square meters, a jib of 25 square meters and a Gennaker of 110 square meters. They displace 1250 kg of water (slightly more than me!) and sorry for the inconsistancy in units of measurement! The teams seem to be representing their countries (11 in total) and currently the leaders after Act 7 are Groupe Edmond de Rothchild (France) with 61 points followed by Luna Rosa (Italy) on 59 points and third is Emirates Team New Zealand (New Zealand) with 54 points. Points are allocated as follows: 1st place = 11 points, 2nd place = 10 points, 3rd place = 9 points, I think you get the idea, and penalty points can be awarded for crashing into other boats, or causing a nuisance by sailing badly. Double points are awarded for the final race at each venue, which can result in some very extreme sailing and a tense finish. The winners of the series receive just the honour of winning! Recent changes have meant that the sailing courses are set out close to shore at each venue so spectators have an up close and personal view of the action, and it really is not to be missed. 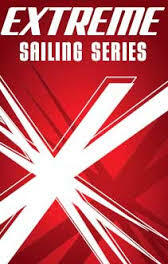 All that remains to say is if you would like to know more there is an excellent website at Extreme Sailing Series. Here you can find information on all the teams, the results, venues and also photos and videos of the Acts. See you in Almeria!